Please tick respective "Size" above to order 24'/32"/43"/55"
Check here for 22 inch (optional Motion Detection). The DPF24FHD/DPF27FHD/32FHD/DPF43FHD/DPF55FHD series come with a extra larger 24/27/32/43/55 inch (1920×1080 pixels) full-HD super clear professional grade LED backlgihted display that offers a toughened glass laid on top. They all come equipped with Mstar chip, clubbed with high power GPU and EOOKE's "Trueback" image engine with which you can except top quality sharpest image with beautiful colors viewing experience, this will definitely impress your eyes. The slim profile is undercut a small stand for easy gripping. .It has a USB 2.0 porst to enable itself read files from flash drive, it also includes a SD card slot for using SD/MMC cards. One of the important thing is that apart from its big size, the devices still maintains the same thickness. 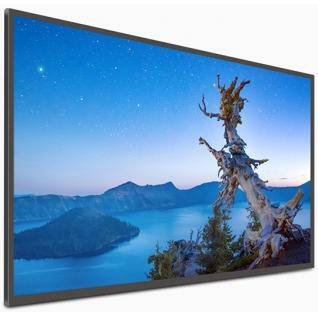 Size 24" 27" 32" 43" 55"
Wall mountable Yes, 4 mounting holes. Note: No wall bracket is included for DPF43FHD & DPF55FHD, you can easily get yourself a VSEA 400 x 400 wall mount locally. Is there an option for longer rotation of photos - such as 5 minutes? If not, will it burn the image into the screen if one is left on there for a long period? We actually would like to change images hourly. Please check our digital signage display https://www.digitalframe0.com/category-29-b0-Digital+Signage+Displays.html which supports custom interval timer. I want to automatically cycle through photos on a flash drive. Will this unit do that? It notes "toughened glass" in the description above. I'm thinking of using this in a commercial space and need tempered glass - can you confirm if it is actually tempered, safety glass? Yes, it has, toughened glass = tempered glass. Do these monitors have any option for motion activated playback? unfortunately it doesn't, the biggest motion detection frame we have at the moment is DPF20HDa. does this 24 inch dpf have any internal memory for data? or we have to use sd card? It does not have any built-in internal memory, you can use USB drive and SD card for data.